If you are like the majority of Mozilla Firefox users, you have probably have had times when you have too many tabs open that nothing is really visible. However if you install the FaviconizeTab extension, which works on Windows/Macs/Linux, you will have the ability to click on any tab and minimize it to nothing but the site’s icon. The extension can be customized from the option’s menu to minimize/expand on a double-click, alt-click, ctrl-click, or shift-click. Another nice addition which the developers included is the option to enter a list of URLs, which the extension will automatically minimize when opened. With this extension and Firefox 2.0’s new tab scroll bar, there will be much more room for navigating tabs. 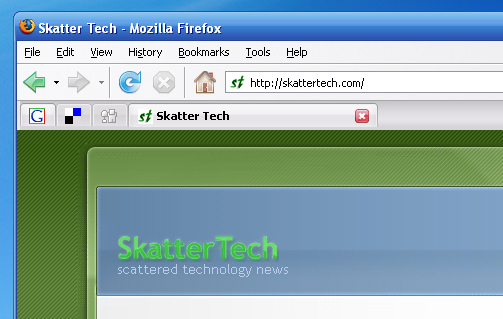 If you know of any other good extensions for Firefox 2.0 which will improve tab usage, please let us know! Just signed on to Verizon. I now have 16 unsought Verizon tabs showing in Firefox. It’s like a virus. Are others having this problem and does Faviconize solve this problem? I am the worst at leaving windows and tabs open, its almost a daily occurance that i max out my PC to the point where i can’t actually open anymore windows period. While this extension won’t solve that problem exactly, at least now i can actually see whats going on with all my tabs. Definately a good addition to my current extensions. Thanks for the heads up. Don’t use Verizon as your home page, then you won’t get unwanted tabs.